This is an updated version of lftextures. 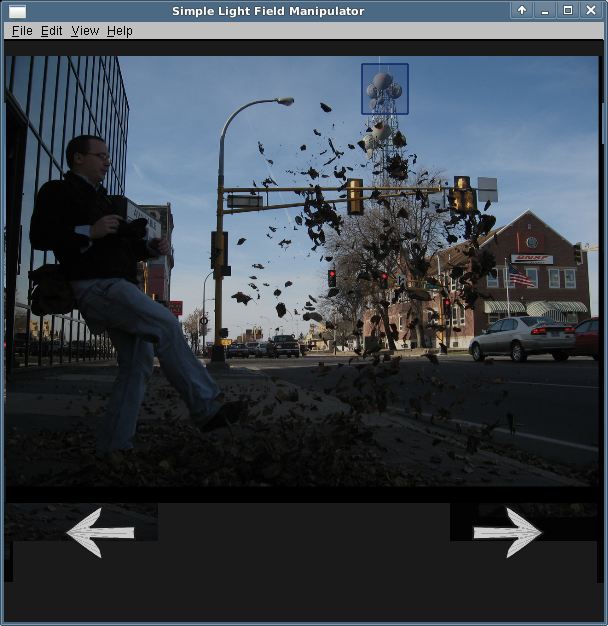 lfmanip makes use of the OpenCV libraries and the SURF algorithm to generate feature points, which are then used to match features between images, allowing us to automatically align the images in the application, rather than requiring the user to do so before hand. Currently the code isn’t very fancy; it must match the same feature in all images or else it’ll fail. It’s also a bit slow, it takes approx. 4-12 seconds per image to calculate all of the SURF points. I haven’t polished the code base as well, so if a segmentation fault or crash happens be sure to e-mail me with a short description of what happened. To use other datasets with this program, just drag and drop a folder containing your data onto lfmanip.exe and it’ll load those images; otherwise it will use the hard-coded “lf/” directory. In the first view, use the drawn arrows to page through the images, and look for a suitable feature. In the provided dataset, the tower on the top of the image looks suitable. Drag a selection box around the feature you think will work, at this point lfmanip should freeze. Watch the command window for output. If lfmanip finds the same feature in all images, it’ll write it’s findings to “offset.txt” in your image directory and switch to viewing mode. If it does not, it’ll draw red dots where every feature was found. At any point, (except when processing a selection) you may hit the ‘S’ key to switch between the two viewing modes. Otherwise, the controls are on-screen and are the same as lftextures‘. wow, Marti, this is not only an amzing little app, but tons of fun too… keep up the good work! Send me an email, then I'll place our discussion on this page (with your permission).